The mega distribution centre is ideally situated alongside the R300 between the N1 and N2. Roofing and Ceiling specialists, Scheltema, were selected by the project team to ensure the highest standards of quality, safety and production. Shoprite Checker’s main objective for Cilmor Distribution Centre is to supply all products to Shoprite Checkers stores in the Western Cape. 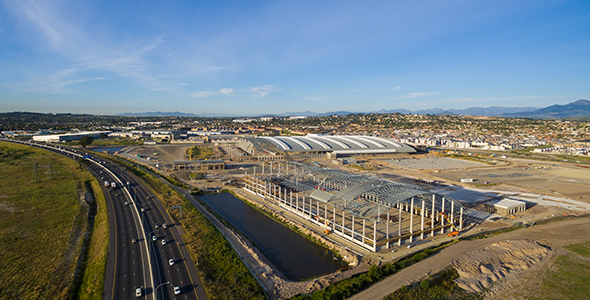 It is a mega distribution centre for Shoprite Checkers and is located within a few kilometres of existing Shoprite distribution centres as well as their South African Head Office. The development is situated close to the R300 road which is the junction between the N1 and N2 highways in Cape Town. Scheltema’s engineered fall restraint system. The centre is approximately 150 000m2 in extent. This includes a dry goods warehouse, the returns warehouse, refrigerated building and out buildings. 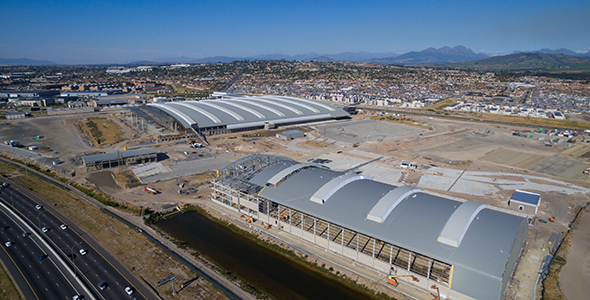 “It is my opinion that erecting a mega distribution centre of this magnitude in this location emphasises the company’s leading position in retail in Africa,” says Dave Payne, contracts director at Schetlema. Scaffold ramps used as the method of moving roof sheets into position. The roofs are of a curved design and have bullnose ends. This curve and bullnose design minimises the necessity for standard gutter systems which reduces the scale of maintenance required. The design of the building allows for optimal use of natural light, which is captured through vertical polycarbonate sheeting on both sides of the monitors of the main roof. The design of the ventilation system allows for automatic and manual control of both smoke and normal ventilation. The ventilators are located at intervals between the vertical polycarbonate sheeting on the sides of the monitors, which are located of the main roof. Scaffold ramps used as method of moving materials into position. The insulation material used is 50mm Fibreglass with a white finish. This insulation is non-combustible and has excellent insulation properties. It is placed over purlins on straining wires below the roof sheeting. Because the sheets are too long to be transported by road they are manufactured to length on site. 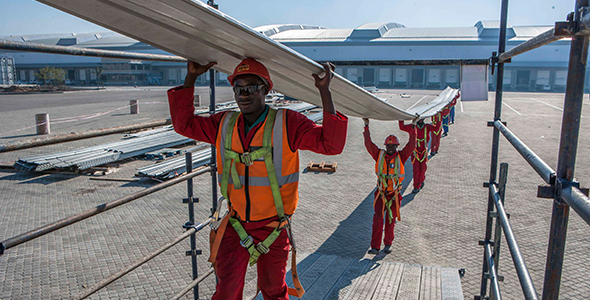 To facilitate the hoisting of the roof sheets onto the roof structure, up to 40m long access scaffold ramps were constructed, where necessary, as the roofing progressed. The 98m long roof sheets (some weighing as much as 500kg) were carried manually overhead up the ramps to the roof structure. The image above serves to demonstrate the scale of the project and the monitor design that enables natural light to enter the building. To ensure safety of staff on site, Scheltema employed a height safety risk specialist and controls engineer. 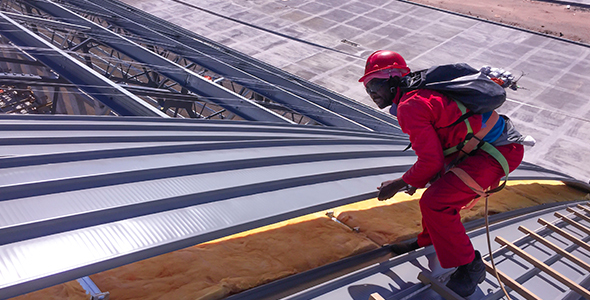 This specialist designed a safety specification for the roofing process undertaken by Scheltema which incorporated the method statement, risk assessment and fall protection plan. 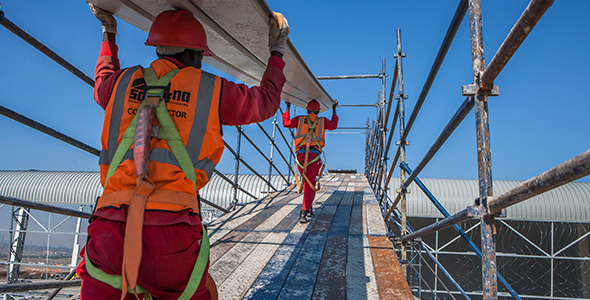 It was mandatory for everyone who gained access to the roofs to undergo safety training that was designed and implemented by the height safety risk specialist and controls engineer. This training entailed using safety equipment and safety procedures on a simulated replica that was a scaled down version of the roof structure of the Cilmor site. Workers who underwent this training had to display competence and understanding of the safety procedures to be allowed to gain access to the roof. The safety system used by Scheltema on the Cilmor Distribution Centre is unique in that it is a fall restraint system and not a fall arrest system, as is commonly used in roofing. For example, each person who succeeded in the safety training was issued with specialist equipment such as horizontal safety lines and certified ropes using a grab system. “We are very proud of the contribution that we have made at Shoprites’ Cilmor Distribution Centre and also of the awards that we have received on site for safety,” say Payne.